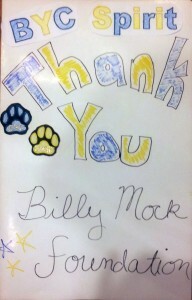 The Billy Mock Foundation (BMF) has 3 programs providing service to the community. Three are managed by members of the board and 1 is managed by our junior board which is designed to encourage youth to be active in their community. Families-in-Need Program – provides financial support along with other resources to families in need within the Philadelphia/Tri-state region. Families are considered on a case- by-case basis. Our focus is on providing support to families with a sick child or a sick parent in the home. The foundation is actively reviewing candidates for grants. Pay-it –Forward Program – provides grants to individuals and local organization making a difference in their community. The BMF is looking for individuals and local organizations working to make their community a better place. The Foundation prefers to fund specific projects. Grant proposals should include description of organization, outline of the project, contact information, website and social media links for organization. Proposals are accepted and reviewed year round. • Provided a grant to BYC Spirit Cheerleaders. Spirit squad is made of special needs cheerleaders and volunteer coaches. The Educational Grants Program provides educational grants to local students and school programs. • Individual educational grants have been awarded to students from St. Thomas the Apostle, Holy Savior/St. John Fisher, St. Joseph’s, and St. Cornelius schools. • Institutional educational grants have also been provided to Drexel-Neumann Academy in Chester in support of their virtual 9th & 10th grade programs.